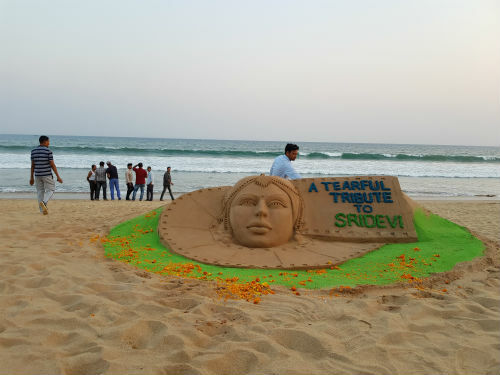 Puri: International Sand Artist Manas Sahoo expresses his deep condolence to Legendary Actress Sridevi through his sand art at the sea-beach of Puri. Sridevi who was a very famous Bollywood actress and film producer who has acted in Telugu, Tamil, Hindi, Malayalam and Kannad movies is known all over the world for her talents. The whole nation is saddened with her sudden demise. In order to pay homage to the legendary actress, sand artist Manas Sahoo has built a sand sculpture of 10”feet in length at the sea-beach of Puri. This sand art has been built at the Manas Sahoo Sand Art Institute. Here Shri Manas Sahoo has paid his deep homage and condolence to the great actress and where her fans too paid condolence to the veteran actress. In this sand art Shri Sahoo has given the title “A Tearful Tribute to Sridevi”.